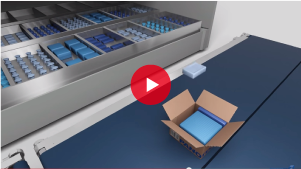 Increase loading efficiency!Packing using boxes in the right size helps to increase loading efficiency, therefore, you can expect to reduce logistics cost. Speed-up packing! Packing for large goods and goods of peculiar shapes requires patching of existing boxes. 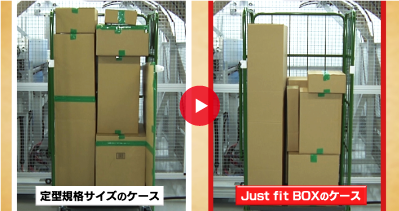 However, our Box on Demand machine system helps you to avoid wasting time during packing operations. 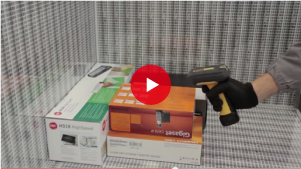 Right fit!Packing with boxes in the right size reduces cushioning materials used to fill empty space in a box. This leads to an improvement of customer satisfaction as well as a reduction in the environmental burden. Reduce wasted space at warehouse!Stock of boxes in a large variety of sizes can be consolidated in several PATADAN. You can be free from the troublesome labor related to orders and inventory. 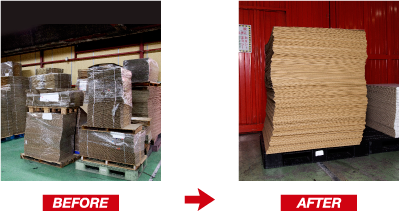 You can produce large-size corrugated boxes, which are normally hard to procure, as needed. 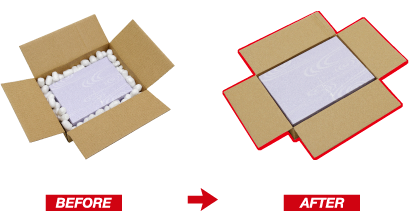 You can package goods by using boxes in the right size to fit the goods.